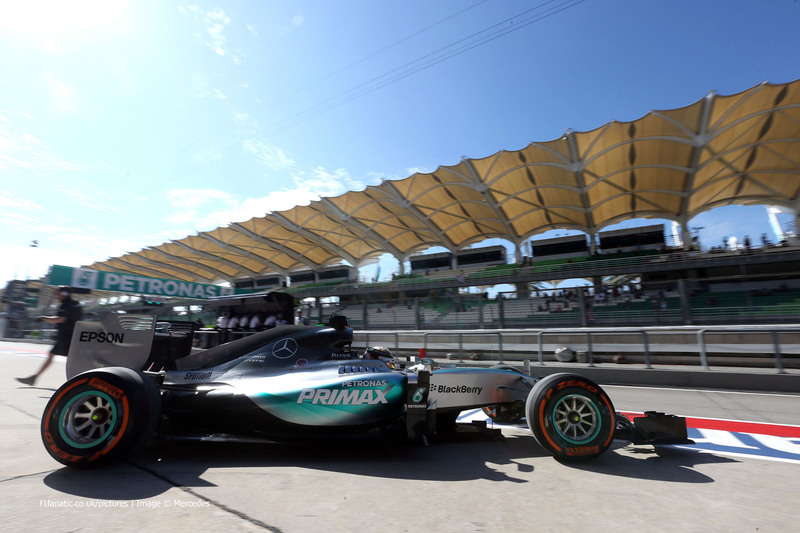 The second event of the 2015 Formula One season got under-way this morning at the Sepang International Circuit in Malaysia with the two Friday practice sessions. Nico Rosberg and Lewis Hamilton each topped a session for Mercedes, but Kimi Raikkonen finished second on both occasions. 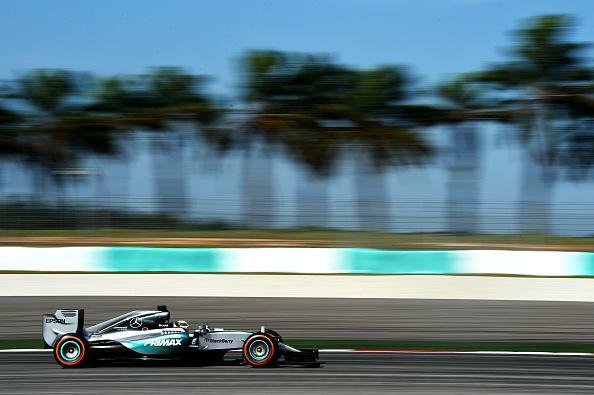 Clear, sunny conditions greeted the drivers in the first practice session, with Nico Rosberg getting his weekend off to a good start by finishing fastest in the first 90-minute session. However, team-mate Lewis Hamilton failed to set a lap-time after his car stopped at turn nine, with the team explaining to him that they were concerned about the power-unit in the #44 car. As a result, one Mercedes finished fastest, one Mercedes finished 20th and last. During the build-up to the Malaysian Grand Prix, the Mercedes duo had talked up the potential pace of their closest rival in the season-opener. Both had said that Ferrari could emerge as a contender in future races. Kimi Raikkonen showed that this could indeed be correct as he finished 2nd fastest by three tenths of a second, with team-mate Vettel half a second slower in 3rd. Romain Grosjean showed reasonable pace in the Lotus-Mercedes as he finished 4th fastest and was 1.4 seconds off of Rosberg’s time. He finished just ahead of Carlos Sainz who stated that his Toro Rosso’s Renault power-unit had much improved drive-ability. He finished the session as the fastest Renault-powered car in 5th place. Since the Australian Grand Prix, the gloves have come off in the quarrel between Red Bull and their engine supplier Renault, with both parties blaming each other for Red Bull’s lack of pace. Daniel Ricciardo showed that he was still in the mid-field area in practice one by finishing 6th fastest. He was a few hundredths quicker than the second Toro Rosso driver Max Verstappen. On his return to the Williams cockpit after picking up a back injury during qualifying in Australia, Valtteri Bottas finished 8th fastest after 23 laps. He was ahead of the second Red Bull of Daniil Kvyat and the Sauber of Marcus Ericsson; who completed the top 10. Valtteri also finished ahead of his team-mate Massa who was just outside the top 10 in 11th place. Bottas wasn’t the only driver making his return to the cockpit, with Fernando Alonso completing his first running the the McLaren-Honda since suffering a concussion in a pre-season testing crash. He was out fairly early in the session and went on to finish 14th fastest with 20 laps under his belt. He was just 2 tenths slower than Raffaele Marciello. The Italian is Sauber’s third driver and was substituting for Felipe Nasr in this opening practice session. The start of the session saw a momentous moment for the Manor F1 team as they finally turned a wheel this year after completing a last-minute deal to save the team from the brink of closure. The team were present at the season-opening round, but were unable to complete any running after all of their previous software was wiped, meaning they were unable to start the car. Will Stevens was the first to take the Manor around on an installation lap, with team-mate Roberto Merhi following him soon after. The pair completed 8 laps each and crucially were within 107% of Rosberg’s P1 time; meaning that the team could very well qualify for the race despite having 2014 specification Ferrari engines. Lewis Hamilton’s first practice engine problems didn’t prove to be terminal for the Mercedes driver, with the team stating that the glitch would not affect the life of the engine. The mechanics were working on the car as the session began, but Hamilton would later emerge on track to take the fastest time of the session which was 3 tenths of a second fastest than Rosberg’s time from first practice. Once again, Kimi Raikkonen was second fastest by the exact same margin of 0.373 seconds. He was a tenth quicker than Nico Rosberg in the second Silver Arrow after the German made a mistake on his medium tyre run. He couldn’t find time on his second attempt after track temperatures rose considerably. Daniil Kvyat appeared to be having an upturn in fortunes after setting an impressive 4th fastest time in the Red Bull, but at the end of the session he developed an engine problem that relegated him back to the pits. He was just ahead of the two Williams cars of Bottas and Massa who finished in 5th and 6th place respectively. Sebastian Vettel was 7th fastest and was the last driver within a second of Lewis Hamilton after getting within 8 tenths of the world champion. Max Verstappen was 8th fastest ahead of Marcus Ericsson, with Daniel Ricciardo’s troubles seemingly continuing as he could only manage 10th place. Fernando Alonso continued his re-acclimatisation with the McLaren-Honda. He finished 16th in the second session and added 25 laps to his tally from practice one. His total for today lies just short of a full Grand Prix distance. The two Manor cars were also getting themselves up to speed, with Will Stevens impressively just 5.9 seconds off of Hamilton’s time. Team-mate Merhi was 7.4 seconds down, but had only completed half the amount of laps that his team-mate had accomplished.